Microorganisms can grow in a broad array of temperatures from below 0°C to over 100°C. Optimum temperature growth requirements can place microorganisms into four different groups. Psychrophiles: grow between -5°C and 20°C. These organisms can be found in the waters of the Antarctic and Arctic. Mesophiles: grow between 20°C and 50°C. Most of the organisms fall into this temperature range, with many pathogens growing between 35°C and 40°C. Thermophiles: grow between 50°C and 80°C. These organisms occur in soils or compost piles. Hyperthermophiles: grow above 80°C. These organisms occur in thermal vents or environments where volcanic activity is found. Temperature affects many metabolic factors in a cell. 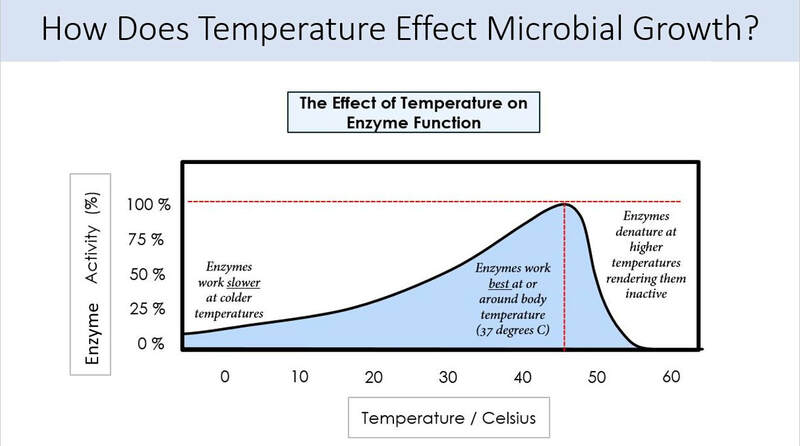 Enzyme function or activity is directly affected by temperature. The cell membrane and transport can be affected by temperature as well. Ribosomes can also be affected by temperature. In this experiment we will look at the effects of temperature on growth of several organisms and how it effects pigment production of one of them.